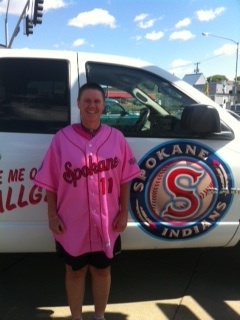 What an amazing night at the Spokane Indians Pitch for the Cure benefiting the Eastern Washington Susan G Komen! I gave an inspirational message and then threw out the first pitch in front of a crowd of 4,997! Then spent time in the dugout with the players and then the Komen skybox. What an amazing night! I love the PINK Jersey that ROCKS. . . Keep up the Fabulous work you are doing. . . . SELF EXAMS SAVE LIVES LADIES .. . . yes Mammograms do too. . .hahaha!